At 8:30 a.m. on Tuesday, Sept. 11, Darien’s Monuments and Ceremonies Commission invites the public, first responders and town officials to a memorial service at the 9/11 Monument, located on the grassy area behind Middlesex Middle School on Hollow Tree Ridge Road. The Memorial is flanked by two tall trees on either side symbolizing the twin towers. Phil Kraft, former Chairman of the Monuments and Ceremonies Commission has agreed to conduct this ceremony one last time. 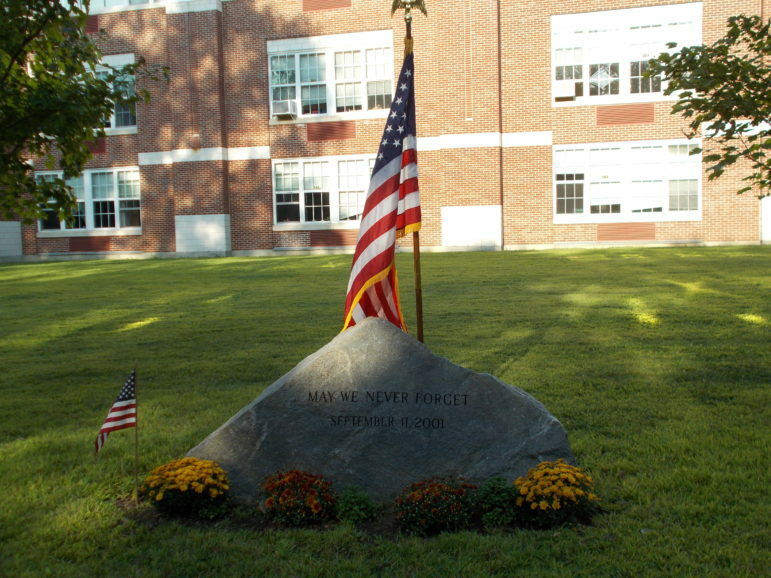 An Eagle Scout project, conceived, funded and installed by then Darien High School freshman, Josh Doying who belonged to Boy Scout Troop 53, the Memorial was dedicated on Sept. 11, 2003. After the attacks of September 11, 2001, patriotic citizens displayed the American flag everywhere. Josh cut out a flag from the newspaper and taped it to his bedroom wall. He noticed how it faded and he was concerned that our memory of this tragedy might fade as well. Josh wanted an enduring memorial and selected the location so that students would see the stone and ask about its meaning. Josh drew the plans, approached then-First Selectman Bob Harrell and the Monuments and Ceremonies Commission for approval, raised the funds and oversaw the installation of the project. Josh even left a residual fund so that the trees could be replaced if necessary. Everyone is encouraged to attend this year’s ceremony. This article, an announcement from the Darien Monuments and Ceremonies Commission, was written by Karen K. Pollett, a member of the commission. This article was originally published on Aug. 28. The time stamp was changed to put a link to the article back on the home page. Gather your Easter baskets and come out for an Easter Egg Hunt on the front lawn of the Darien Community Association! This annual event is a great way for children to get into the spirit of the holiday.